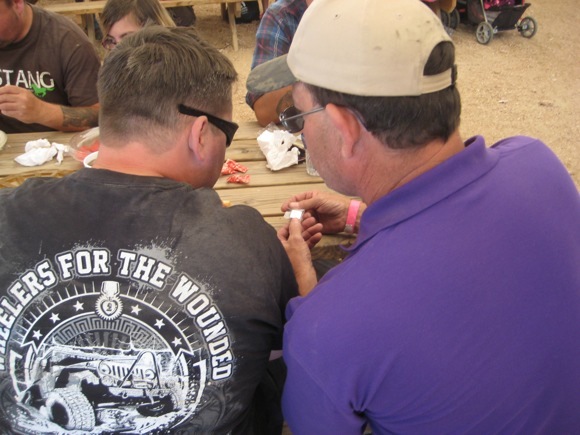 We're making silver bars again this year to donate to the wounded soldiers attending the WFTW Main Event at Hidden Falls Adventure Park in Marble Falls, TX May 2nd, 2015. All of the bars donated will be given directly to soldiers at the event. You may either send the silver to David or purchase the silver for spot + $1. (.999 silver only) David will donate his time and materials plus the extra silver required. It actually takes a bit more than 1oz to make a 1oz bar. It's called the angel's share. Please post your donation in this thread, or PM me if you'd like to remain anonymous. Thank you for supporting our wounded soldiers! Set me down, gentles, for four ounces, and PM me an address to mail em to. Where/how to send funds Duck? Blue Angel wrote: Where/how to send funds Duck? I too need the info. Thanks for doing this. We're up to 22 ounces already! I will do 2 ounces. Please PM payment instructions. I will donate 2 oz. also. Mahalo for doing this again!! 2 oz here too. pls send payment info. I will do approximately 3 ozs.. In the mail monday..
We're up to 42oz now! A big THANK YOU guys and gals. MaxGravy wrote: We're up to 42oz now! A big THANK YOU guys and gals. Pretty impressive but I KNOW we can get to 50 ounces. Put me down for 10 ounces, Dave or Randy, PM me a paypal addy and the total, and I will get it paid today. Why 10 ounces you ask? Because I was at the event last year and will be going again this year and this is one cause I fully stand behind. Last year Blue Angel walked around in the crowd passing out bars to wounded vets and seeing the looks on their faces to just be given something that they really didn't know what it was about or why it was happening but that some stranger cared enough, was priceless. RyanEOD wrote: Put me down for 10 ounces, Dave or Randy, PM me a paypal addy and the total, and I will get it paid today. HOW COOL IS THIS!!!! WAY TO GO!!! Put me down for 4oz. This post made my day Ryan. It was very emotional for me to be able to hand those out to the vets. Thank you all for your donations!